Transform low cost wells into cored, tested wells. PetroDB-WEB is the WEB implementation of PetroDB-Vault, a fully flexible IP or Geolog evaluation command file linked to a 28,000 core plug petrophysical database, PetroDB. IPPetroDB Integrated Petrophysics with PetroDB is the training course which explains and demonstrates this functionality using a variety of Reservoir Types and Reservoir Rock Types. The course serves as an introduction on how to do a thorough, modern petrophysical evaluation properly and also on how to use the upcoming PetroDB-WEB service. Logs are interactively calibrated to rock-typed hard data to create a convincing and uniquely powerful formation evaluation tool. Calibration is performed via an 18 parameter diagnostic interactive plot which selects rock-typed equations and parameters. It can also be performed externally in Excel for ad-hoc calibrations increasing its flexibility to allow use exotic non-log data with logs, quantitatively. PetroDB-WEB is being developed as a web based app. PetroDB consists of over 28,000 rock-typed, routine core plugs, SCAL, formation pressures and well tests. These have been intelligently cross-referenced to basic geological information, conventional logs and modern special logs over 25 years of technical consulting and 60 detailed reservoir studies. The power of this petrophysical database is captured during petrophysical evaluation by it’s interface with PPL’s proprietary Hierarchical Evaluation Command File “The Vault”. The Vault uses over 200 equations calibrated with Reservoir and Rock Type specific relationships extracted from PetroDB. In-out switchable modules use the PetroDB data which meet selection criteria to calibrate that well’s available special logs including NMR, ADT, SSCAN and inverted log analysis equations to address each reservoir’s specific issues. This PetroDB-Vault, logs to hard data integration, is not a “black box push button” process run by a computer operator! It is expertly tailored to each reservoir via a fully transparent, documented process which can be challenged and modified at any point by a colleague, skeptical partner or adversary. The PetroDB-Vault methodology provides an extremely flexible, convincing and uniquely powerful formation evaluation tool which may be applied to any well, reservoir or field, clastic, carbonate or fractured. PetroDB-Vault results are definitive and cannot logically be overturned. Why? Because they are the result of an agreed, transparent, hierarchical and hard calibrated process with each step open to interrogation and editable to the agreed consensus input. PetroDB-WEB is not a “Black Box” like typical log analysis software products. All available data is used and the integration steps are fully transparent, documented and agreed. “What If” scenarios may be run at will. 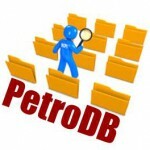 PetroDB-WEB is used routinely for all PETROPHYSICS Pty Ltd technical consulting projects. Prediction: the PetroDB-WEB linked petrophysical database will become the benchmark methodology for performing petrophysical evaluation. Pc (capillary pressure) air-brine and mercury injection >12,000 points! – Client contacts PPL with specific questions regarding a well or field where data is insufficient to provide confident answers. For example, saturation or permeability are uncertain, a geomodel capillary pressure saturation-height function cannot be defined or a petrophysical audit is required. – A hard data base of core and tests is identified by intelligent cross-referencing of basic geological information and conventional logs to assess task feasibility. The extent of the available hard data is communicated to client together with the defined Reservoir Task, Fixed Lump Cost and Time. – When approved, PPL expertly integrates and interprets the found hard data to answer client’s specific questions. – Finally, a brief Reservoir Task Report is produced including Results, Assumptions, Uncertainties, Recommendations & Figures. The process is completed on time and within budget. PPL will exploit all resources at it’s disposal to answer client questions and communicate findings effectively. Expensive “Black Box” results are rejected. PPL will then endeavor to work with client to effectively implement the Reservoir Task results. Interactive Petrophysics or Geolog licensed Software, “PetroDB-Vault” proprietary evaluation command file, PetroDB data base, 200+ equations, batch files & macros, MSOffice and Laptop charged at 10% of day rate.